Local guides will impart historic facts and local lore on walking tours of Dublin’s Trinity College, Galway and Waterford. See the beautiful ruins of the sixth-century monastery at Clonmacnoise on the banks of the Shannon. 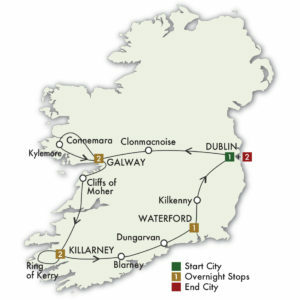 8 breakfasts, 2 lunches and 4 dinners including a traditional Irish Night in Killarney, and O’Connell’s Restaurant in Dublin. Tour begins 1:00 PM at your Dublin hotel. Head out for an introductory tour of Dublin including O’Connell Street, St Stephen’s Green, the seat of government at Leinster House, and other public buildings. Take a stroll through Trinity College’s campus in the center of the city with a guide and view the priceless 8th century Book of Kells, an illuminated manuscript of the four gospels. Enjoy a welcome drink with your group and then enjoy an independent evening at one of Dun Laoghaire’s many restaurants or pubs.